My name is Neil McElroy ~ I am a member of ISALC (the International Society of Animal License Collectors). 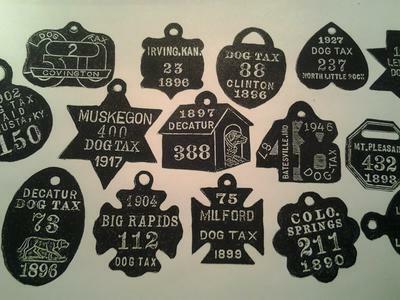 We are always looking for newly discovered DOG TAX tag and DOG LICENSE tag finds. We keep record of all known pre-1900 tags and oldest known tags from all issuing agencies (State, county, township,city/town, etc.). Have you dug up an old dog tag (not military I.D. "dog tags")? 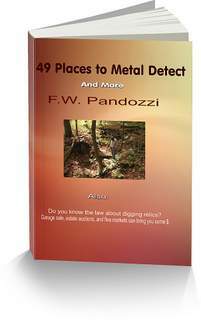 PLEASE e-mail me pictures and info on where it was found ~ oddcoins@msn.com . If you have a new O.K. (oldest known) or any newly reported tag then I will forward the info to the author of US DOG LICENSE TAGS Dr. William Bone. He will record the info and reflect it in the future printings of his book! Comments for Got Dog Tags?! Jim, thank you for the compliment. Glad to hear you are now part of the hobby. Keep us posted here with what your finding. If you need help or advice contact me using the "Contact Me" form. This is a great idea!! !Something different and is our history. Good to see someone that takes pride in there finds and to put a story behind it. Keep up the great work guys!!! Neil, thanks for the post. Those are some nifty dog tags. What you are doing is a wonderful idea. I had no idea the organization existed. Hopefully your post will generate some interest.